Did you know that New Mexico's community hospitals add $9.3 BILLION to the state economy? Check it out. We're co-sponsors of the Western Regional Trustee Symposium, June 5-7 in GORGEOUS Missoula, MT. Hospital Trustees from throughout the West and Midwest come together around leadership in transformational times. From finance to physician engagement, this conference has your community hospital covered. Registration is open now! Download and share the full brochure (pdf). As of January 1, 2019, hospitals have published charge information online. But charges ≠ cost. Here is some information to help you understand what you are looking at (pdf). Our Roadmap for Creating a Healthcare Work-Based Learning Program offers tips and concrete "how-to" examples for creating experiences that bring youth to careers in healthcare. 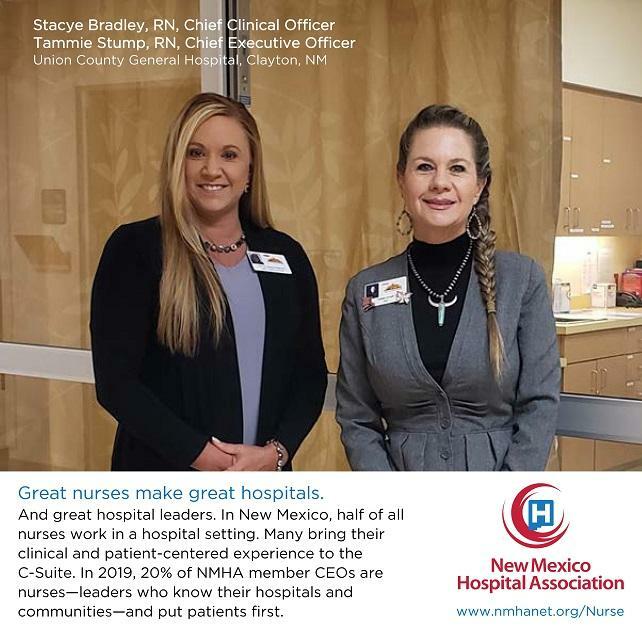 Great Nurses Make Great Hospitals. See our new print ads and read about the work we're doing to support nursing in New Mexico. NMHA facilitated a partnership between hospital EDs, health plans, and software company Collective Medical Technologies (CMT) to implement a system that can improve care and reduce costs. Read it in Forbes. NM hospital leaders share best practices and lessons learned, in a user-friendly listen while you live format. We've joined with NMDOH to promote knowledge and skills for healthcare professionals to address and decrease tobacco use. Earn up to 2.6 hours of Continuing Nursing Education (CNEs) or CMEs (prescribed credits). Access all 3 different webinar modules here. See our new print ads and read about the work we're doing to support nursing in New Mexico.